I know what you’re saying: “Beef stew? Didn’t she just post Beef Stew last month?” Yes, but that was Slow Cooker Beef Stew. This is Pressure Cooker Beef Stew. Beef Stew is the first thing I made when I finally succumbed to all the hype and got an Instant Pot. But I made Slow Cooker Beef Stew, using the Instant Pot in its slow cooker mode, which is really what I bought it for. It was fabulous! Then I decided to try it out in pressure cooker mode. I wasn’t entirely happy with the result. I tried not browning the meat as an added timesaver, but browning adds flavor, so I added back that step the second time around. And I shortened the cooking time on this second batch. Went from 35 to 30 minutes, and next time I’ll try 25 minutes. I cut the beef into much larger chunks this time, as the typical size pieces all but disappeared that first time. It’s always better to buy a 3-pound (or so) piece of chuck and trim and cut it up yourself, as I did this time and usually do. 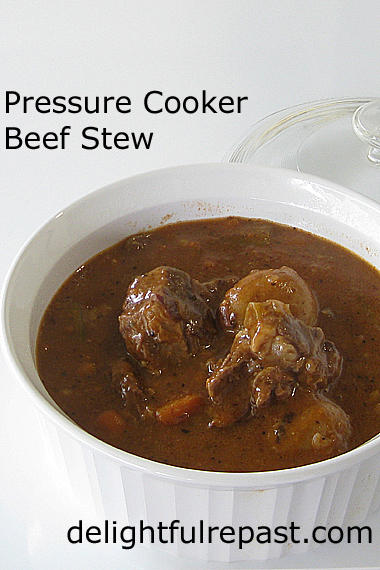 Packaged “stew meat” simply disappears in the pressure cooker. If you have a good sharp knife, you won’t have any problem. I’ve come up with two ways to cut down on grease splattering during the meat browning in Saute mode. The first way, shown in my Slow Cooker Beef Stew post is fine if the second way isn’t an option for you. The second way works with your range hood/extractor fan. Protect your kitchen from grease spatters when you saute in your Instant Pot or other countertop appliance by setting the appliance on your stovetop to take advantage of your range hood/extractor fan. This recipe serves six OR makes three meals-for-two, so I immediately divided it into three and popped one in the freezer for a future meal. We love having a stash of homemade freezer meals. My "verdict," so far, is: I don't think I really need a pressure cooker and will probably use my Instant Pot as a slow cooker most often. It's the only multi-cooker slow cooker I've found with a stainless steel cooking pot. As I get more proficient with the Instant Pot pressure cooker, I’ll come back here and make updates to this post. And if you have any hot tips for new Instant Pot users, do let me know. Note: Some Instant Pot and slow cooker users have told me they don’t bother to brown any meats, they just throw the meat in with all the other ingredients. But I’ve never been happy skipping that step, and I brown the 2.75 pounds of beef in three batches. 1 Plug in the Instant Pot. Select the Saute program. Leave the indicator on Normal temperature. When the word Hot appears on the display, add 1 tablespoon of oil to the stainless steel cooking pot of the Instant Pot. 2 Put the flour on a dinner plate. Dry the beef cubes a batch at a time with paper towel and dredge lightly in the flour, add to hot oil and brown very well in single layer, sprinkling with 1/8 teaspoon each salt and pepper and 1 teaspoon Worcestershire sauce. Transfer browned beef to a bowl. Repeat twice, adding 1/2 tablespoon of oil each time. 3 Deglaze the cooking pot with 1/2 cup of the broth or water or drinkable dry red wine. Press the Cancel key. Add the beef back to the Instant Pot, along with all remaining ingredients except the slurry and garnish. 4 Put the lid in place and turn the steam valve to Sealing. Attach the condensation cup to the back of the unit. Plug in the Instant Pot. Press the Pressure Cook key. Leave the indicator on High Pressure and change the cooking time to 25 minutes. Note: It took 25 minutes to reach working pressure. This varies with the amount and temperature of the ingredients in the pot. 5 Allow the pressure to release naturally until the float valve drops down. Note: This took 42 minutes. It can take 10 to 40 minutes or more, depending on the amount of food in the cooker. 6 When the float valve drops down, press Cancel (display will read OFF, indicating the cooker is in standby mode) and open the lid. 7 Shake together flour and water until mixture is smooth. Stir the smooth slurry into the stew, taste and adjust seasoning; press Saute and continue cooking, stirring occasionally, for 5 minutes to thicken. Remove bay leaf, and sprinkle on parsley or stir in frozen peas. I can eat beef stew every single day! Isn't pressure cooker is part of IP? The stew looks amazing, Jean. Thanks, Angie. I'll probably use the IP in its slow cooker mode more often than in its pressure cooker mode, but it's nice to have that option. I am going to invent the slow pressure high cooker fast cooker fast pressure low cooker slow low fast cooker cooker nuclear powered steam pot that a cow can just jump into and select his/her method of tanning, and then I’m going to take the tanned hide and make myself a good pair of ski boots. Yup. Still don’t like pot roasts. But to all you who do – including my father – bon appetit! Well, I have a different brand of pressure cooker...and I loved it so well it was a Christmas gift for all my family. I use it more than most of the gadgets I own. Sully, I love it! Great idea! Nancy, I love that you've named your Fagor pressure cooker Mrs Pattmore! :D I've always wanted Mrs Pattmore and Mrs Hughes to come "look after" me! I've posted a number of my slow cooker cheesecakes and am looking forward to pressure cooking one soon. I'll check out that book you recommended, thank you so much. I could look at beef stew often. Such a great comfort food. At this stage of life for me I'll enjoy seeing what people can do with an insta pot and just use my slow cookers till they die. Hope your week is going well. Thanks, Ellen. I'm sure I'll be using the Instant Pot in its slow cooker mode more often than its pressure cooker mode. Thanks, Sylvia. It's kind of fun experimenting with a new gadget! I don't have an instant pot yet, but several I know swear by them. This does look tasty! Thank you, Jeanie. I still haven't come to a definite decision about it! I haven't gotten on the Instant Pot bandwagon yet -- and I probably won't. I have the time to cook and I have a really nice slow cooker. I can brown in the slow cooker so it's a plus. 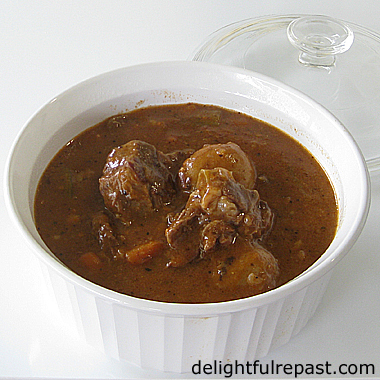 We love beef stew and I'll be making your slow cooker version. Thank you for your honest appraisal. This sounds absolutely wonderful, Jean. I don’t have a pressure cooker nor an instant pot, but I can always make it the old-fashioned way! I love me some beef stew however its cooked!! Thank you for sharing this with us at #TriumphantTales. I hope to see you back next week. Martha, thank you. I'll mainly be using the Instant Pot as a slow cooker. Guess I'm just not in that much of a hurry! Thank you, Marisa. I appreciate that. I like to tell my readers what I really think. Thanks, David. 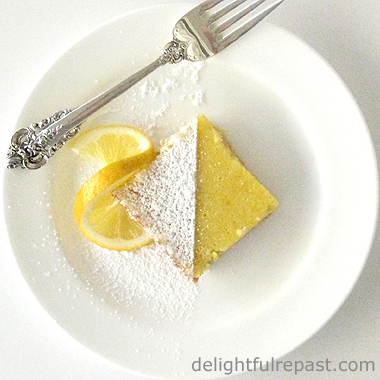 I love cooking the old-fashioned way! Thanks so much, Mrs Mummy. You and Jaki are doing a great job! I love my slow cooker and have no plans to join the pressure cooker era, but nonetheless I found your tip about using bigger pieces of meat useful. Often, in the slow cooker, the meat I put in ends up as more of a chunky sauce than discernible pieces! I have yet to use my IP as a slow cooker...I almost did the other day to make a batch of chicken broth, which I normally make in the slow cooker and cook for a minimum of 24 hours. However, I saw a recipe online that pressure cooked it in about 45 minutes and I had to give it a try to see if the flavor was as good....and it was amazing!! Think of how much electricity I'll save by making my broth in 45 minutes - plus I don't have to plan it so far in advance now - If I want to make soup that night I can make broth in the morning, wow!! I can't believe your husband started in "tidying" with your stuff! I'm glad you now know what I am talking about...yikes, I have so much more to do! I do love your recipe and of course your photo makes your stew look too good to resist! I think for now, my stove top and slow cooker just my be my chosen methods to cook your recipes! Pauline, I've noticed that, too. So I *always* do big chunks. Debbie, thanks for reminding me about the one thing I'm most excited to try in the IP pressure cooker -- stock and broth making! Yes, Nancy, but I actually think tidying is addictive, so that should make it easier, right?! Sue, thank you. And I quite agree--stovetop and slow cooker. They've served us well for a very long time, right? Saving for my daughter to try in her instapot! Great Recipe! Thank you, Jan! Hope she likes it! Your beef stew looks wonderful! I don't have an IP and likely will never have one. I have a slow cooker I'm happy with and I usually have the time to cook so... I'm with you, I would brown the beef first and I can do that in the slow cooker if I want to. I think it gives the beef extra flavour. I'll have to check out your slow cooker cheese cakes. Yum! Have a great weekend! Thank you, Sandi. I, too, usually have the time to cook. And I'm a morning person, so I can get the slow cooker going really early before the rest of the world wakes up! Hope you like the cheesecakes. Thank you, Bellissimamma! Marjoram is under-utilized, so I'm not surprised you haven't heard of it, but it is one of my favorites. This is just what you need for snow days! Thanks, Margie. Yes, it warms you right up! Thanks so much for posting this Jean! Or refrigerator has been broken for nearly two weeks now (compressor going out) and we have been eating as much meat out of our freezer as we can before it all spoils. I have my own pressure cooker beef recipe that I've cooked for years but it would be nice to try a different recipe and this looks delicious! I'll make it tomorrow. Yay for the instant pot version. I'll be trying this one soon. It's snowy here and cold today so I am going to be making beef stew. I'll be making it the old fashioned way though on the back burner of the gas stove. I like it to simmer for a nice long time on a storm day and make the house smell delicious. Richard, glad I could help! Hope you can get through all that frozen meat without too much going to waste. Thanks, Lea Ann. And I'll be back at your blog looking for more Instant Pot tips. ASOS, that sounds wonderful! I love simmering a stew on the back burner of the gas stove in the same pot my mother did the same. Especially on a stormy day. Well a beef stew is always a very welcome thing on these cold days. I don't think I'll be able to justify getting an Instant Pot since I don't use my simple, cheap pressure cooker all that often. When I do use the pressure cooker it's usually to cook larger pieces of meat on the bone (oxtail, for instance). It just seems to work better that way. I do know a very good cook who was born in Bangladesh and he uses a pressure cooker almost every day to feed his family. He says that the flavour of the spices is so much better that way. 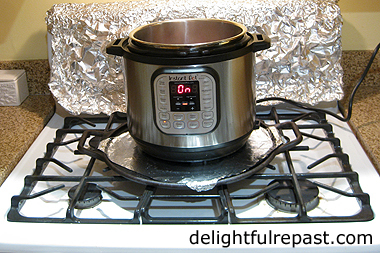 Pressure cookers and now instant Pots are certainly popular. Many thanks for sharing your recipe here. Phil, funny you should mention that because I was just telling someone today that every time I see something about food in India or see a recipe for Indian food, they're using a pressure cooker. I had no idea why, but it does seem that it might intensify the spices. Thanks for the info. Thanks, Jan. I'll probably be using it most often in its slow cooker mode. I haven't yet tried an Insta Pot or pressure cooker, but I'm getting very tempted with all the delicious recipes I am seeing! Your Beef Stew looks delicious, Jean. I like the flavourings and spices you used. Thank you for sharing, and for being a part of the Hearth and Soul Link Party. Hope to see you again this week. Have a lovely week! I'm finding that I will use the saute' mode and get everything going, and then put the IP in slow cooker mode. I guess I like to prepare my meal early instead of waiting to the end. I did make Butter Chicken in the pressure cooker mode, and it turned out really well. Thanks so much, April. My favorite way of cooking remains stovetop and oven! Thank you, Zaa. If you want to avoid having something taking up space and not being used much, really think hard about what you'll use it for and how often. There are people who use them every single day, sometimes running two at once! And those who find they just don't use it much at all. It's hard to know, and no one can tell you! Sue, thanks so much. Sometimes it's fun to just change things up a bit and use a different method! This is great... I was given an insta pot for Christmas/Birthday. I have used it a few times, but I must admit it intimidates me a bit! I have wondered how to balance the cooker on top of the stove. I hate releasing the steam under my cabinets. Great ideas! Thank you, Bonnie. You are the first person to comment on that! I'm glad you found that tip useful. This post is really educational for me. There has been so much in the press about the "Instant Pot." I'm intrigued about it, but I don't think I would use it enough to warrant a purchase. I still really love my ten year old Cuisinart slow cooker. I do like reading recipes for the Instant Pot though. Fun to see how quickly it cooks food. Thanks so much, Nora. I always like to tell people what I really think about the equipment I use! Great tips for the Instant Pot! I just got one for Christmas and have just started cooking in it so these are very helpful to me. Your stew looks delicious, lots of great flavor! Hope you are having a great week and staying warm. Thanks so much for sharing with us at Full Plate Thursday and come back soon! I don't have an instant pot and enjoy reading everyone's opinions...it is very helpful. My feeling is that I probably wouldn't use it enough to justify the room it would take up in my kitchen. Karen, I'm with you on that. If it wasn't also a slow cooker with the stainless steel cooking pot I've always wanted, I couldn't justify it either. Thanks, John. It's so much better to cut it up yourself, isn't it! Mr Delightful doesn't know how I can do it because I'm a little squeamish about meat, but I just pretend it's a vegetable, "go to my happy place in my head" and cut away! Thanks, DaydreamerMum. I'm learning that lots of people don't have a pressure cooker or Instant Pot, and here I was thinking I was the only one in the world without an Instant Pot! Thanks, Tarah! Hope you're having a cozy winter! My husband keeps hinting that he'd like some beef stew lately. I keep hinting I want an Instant Pot or an Airfryer. It's like you wrote this for both of us to win. :) Also, your beef stew looks pretty yummy, so chances are he'll win first. Dean, thanks so much. For some reason, I haven't caught the airfryer "bug" yet (which isn't to say I won't!). Hope you get that Instant Pot soon. And *then* the airfryer! Jean I love beef stew any which way it is cooked. It is hearty food that is most perfect for this type of weather. I need to make some again soon! Thanks, Mary. I had wanted to make some today, but that's not happening. I never made it to the butcher shop.